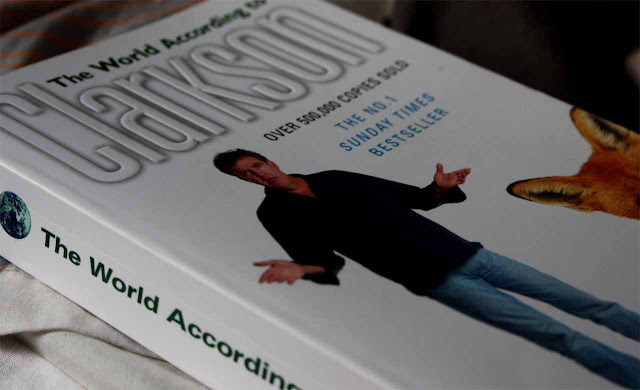 The World According to Clarkson is a collection of articles written by Jeremy Clarkson for the Sunday Times, spanning 2001 to 2003. I just finished listening to the AudioBook. I liked most of his aggressively opinionated but erudite observations. He comes out as seasoned traveler, and discusses topics ranging from restaurant food, environmental protection, urban development, the European Union, and political diplomacy among other everyday topics. It is about the life in the 21st century. Clarkson certainly does not take himself too seriously and his writing is fairly light. He takes a cynical approach and often goes off on a tangent with an entertaining style. I could personally relate to most of the topics he covered. It was hilarious. I especially like when he points out the pompous, the ridiculous, the absurd and the downright idiotic ideas of Governments and Unions. Occasionally, he does talk about eccentric, the clever and the sheer brilliance of institutions. You will laugh. Clarkson does not hide the fact he is not too keen about Mr. Tony Blair or his policies and keeps referring to him as His Tony-ness. Weird. The book is read by Jeremy Clarkson himself and his accent was a bit too British for my liking. I have nothing against Britons, but I got the feeling that it takes a bit more effort to talk with a British accent. They talk slow. Maybe I felt that way because Hollywood and American TV has made American accent a bit more universal. Anyway, it was a good listen. I havent read any of his work. But willing to give it a try. looking forward for the audiobook! I was never a fan of Audio Books, I tend to fall asleep when I listen, but I love to read though. Would try to see if I land my hands on this one. Thanks for the review!